If you live in, or have ever watched TV in the New York metro area, you know that the staff of Fox 5 Good Day New York takes its training very seriously. Weatherman Mike Woods, anchor Greg Kelly, and sports anchor Duke Castiglione are all in fantastic shape and are fierce in the gym, and they’ve graciously had me on their program several times to talk training and goal setting. Here’s an appearance I recently made on Duke’s own private segment, Duke’s Workout, where I dropped some tips for staying on track with New Year’s resolutions—since most people start bailing right around this time of year. Enjoy, and please share with someone you think needs to hear it. And see more of Duke’s fitness segments HERE. FINALLY, a workout plan for the genetically average man or woman who wants to build muscle, burn fat, and get strong—and still have a life! Sign up for a FREE 4-week program. 4 Weeks of Workouts. Free. Today. Sign up for a FREE 4-week workout program, delivered straight to your inbox. 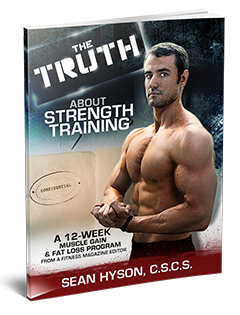 Get on a program that builds muscle and strength, gets you lean, and lets you live your life… based on everything I’ve learned as a fitness magazine editor!